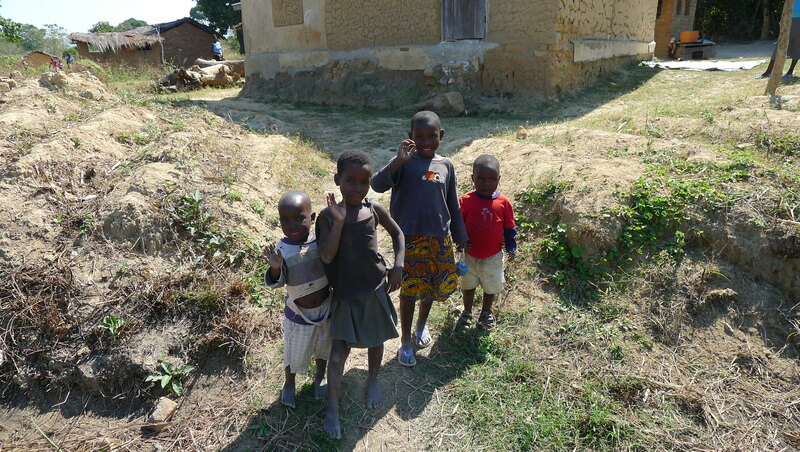 When we woke from our tent at Mama Rulas in Chipata we were confronted with a few options and had make a plan. We could either head to South Luangwa and ride along a truly awful stretch of road that had been ploughed up over the years by over-laden cotton trucks along the 140 kilometers to Mfume; we could ride northwards along sandy tracks and tar roads through Zambia to Tanzania; or we could risk the fuel issue and cross the border into Malawi. Decisions, decisions. Riding the 280 kilometers to Mfume and back would seriously test Fanny’s riding ability, as it did mine the last time I rode there four years ago. Coming off and damaging the motorcycles is a risk you take all the time, but wearing out increasingly worn out tyres on what I remember to be very bad rocky stretches of road perhaps pushed the risk to far. 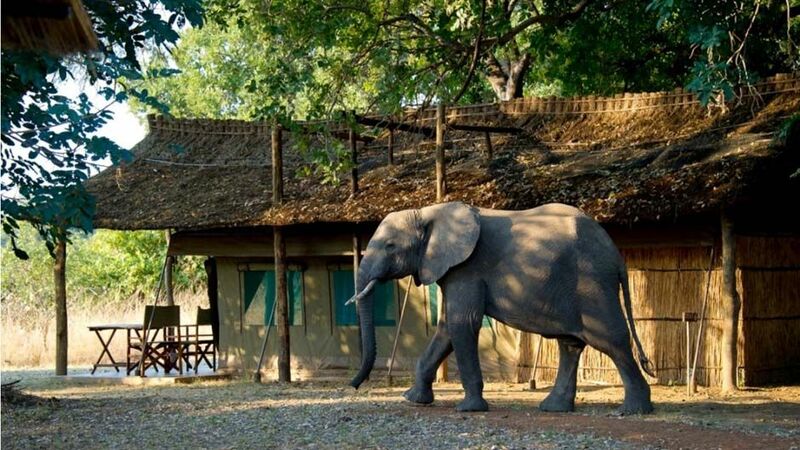 Also, we heard from my cousin, Rosie that Flatdogs bushcamp on the banks of the Luangwa River (Website : www.flatdogscamp.com), a place where I camped up a tree four years ago now preferred more “upmarket” guests and only offered safari tents at US$40 upwards a night… each. 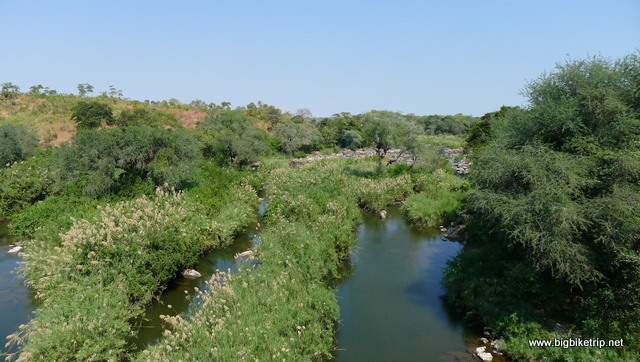 We could, of course, stay somewhere else just along the river as I knew there were other campsites, but with free roaming elephants, hippos, lions and whatever ever else free camping in the bush was not a wise option. Fun perhaps, but not wise. 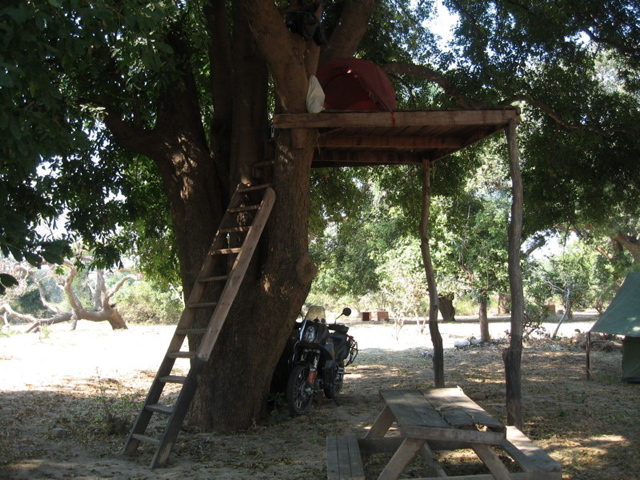 Camping up a tree at Flatdogs fouryears previously with my bike as close to the tree as possible to prevent elephants knocking it over. 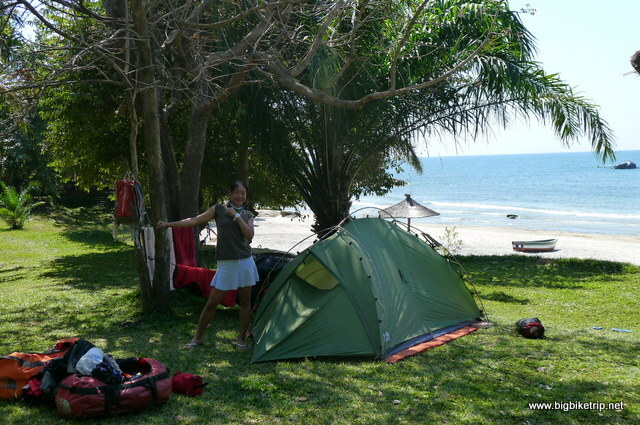 So I consulted with Fanny and she told me, quite logically I suppose, that she had already seen enough elephants and hippos for a while and certainly didn’t want to waste US$80 a night camping in a posh tent. I am always up for seeing more elephants and wildlife, but I had already been there and if Fanny wasn’t fussed then I did not want to put the bikes, and more importantly Fanny through an unnecessary pounding and risk coming off. 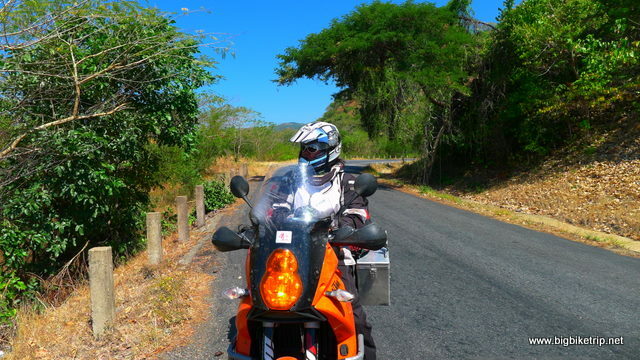 I remember the stretch of road being enormous fun, but also that it was quite dangerous in places and required, on occasions, very technical and precise riding along very narrow paths and ruts where the road had collapsed leaving sheer drops several meter high on each side. The recent reports from locals suggested that the road was atrocious, very muddy, and even the experienced cotton lorries and local 4x4s were taking eight to nine hours to navigate the worst 90 kilometers of the road. Heading off road and following the tracks through Zambia all the way up to Tanzania would be good fun, but I had already done that as well on my last expedition, and so, since I wanted to spend time with Fanny in Malawi by the shores of beautiful Lake Nyana we decided to risk the fuel and hoped the president had thought of his country’s needs before his own and sold his new jet. Ha! As if. 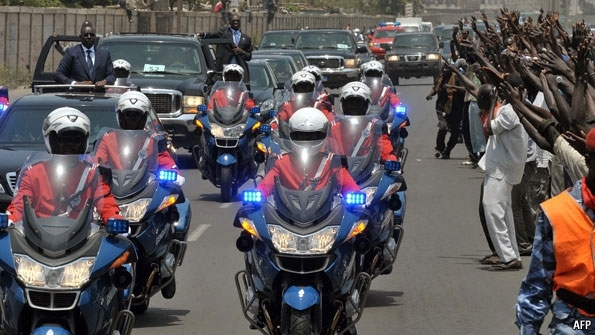 What self respecting African despot would have less motorcycles and vehicles in his motorcade than the President of the USA. Certainly not the President of Malawi. 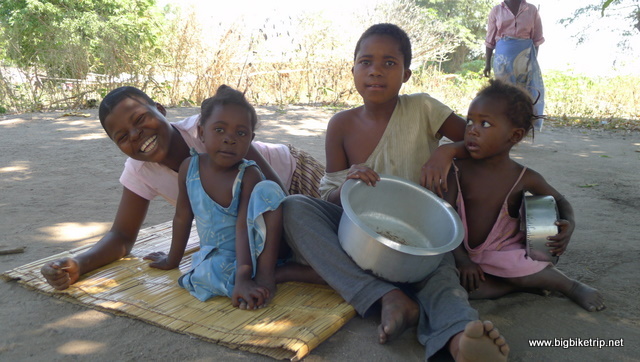 Contributing less than 0.01% to the world’s GDP Malawi is a very poor country with more than half the population below the poverty line. 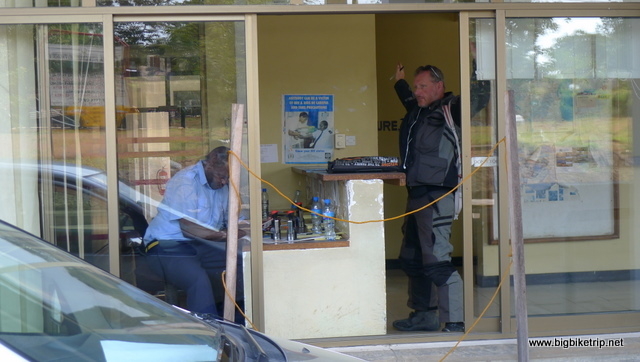 At a very busy petrol station just outside Chipata, and quite near to the border with Malawi I replaced the 10 liter petrol can that fell off Fanny’s bike with a 20 liter cooking oil can that I would strap to my bike and filled up with petrol. 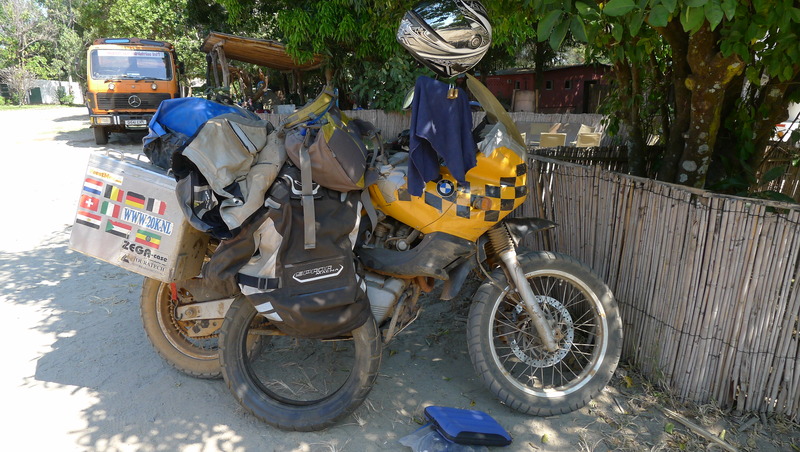 So, in total, 19.5 liters in each of the KTM petrol tanks, 10 liters on the back on Fanny’s bike, and 20 liters on the back on mine….that should get our two motorcycles about 550 kilometers into Malawi. After that we would have to make another plan. After I bought the cooking oil can the petrol attendant said it was illegal to fill it directly from the pump and so we filled 5 liter metal cans and then had walk off the forecourt and transfer the petrol into the plastic can. A pointless exercise really as I spilled even more petrol over the forecourt getting the petrol into the cans than I would have pumping straight into our tank. A very stupid policy that we were to face again in western China. Given the reported situation about lack of fuel only 12 kilometers away across the border there were many other people doing the same thing, although many of the 4x4s had over 100 liters of spare fuel in gerry cans and some the same in their tanks, enough for them to get all the way through Malawi. As we were riding to the border with 20 liters of fuel in a dodgy container placed immediately above my hot exhaust pipes I was wondering whether I should have packed a small fire extinguisher. I was still pondering the risk of going up in flames when we reached the Malawi border and we were yet again confronted with the border mobs of ‘hanger ons’ and scamsters. Crossing borders is the worst part of traveling and usually I am one of the worst kind of impatient tourist and business traveler. However, on this expedition I realized that we were at the mercy of the border officials and I successfully employed the charm offensive with every person we met and could get a gold medal in patience. The problem with motorcycles as opposed to cars is that you can’t lock them up and leave them while you attend to everything, but this time I was not traveling solo and so Fanny usually guarded the bikes while I did the form filling and presented the carne de passage and passports to the various border stations. When I showed the immigration officials Fanny’s passport they would often demand to see her, quite rightly I guess, and I would shout at the top of my voice back to Fanny and she would run in, grin at the official and run back out again and carry on guarding the bikes. Most of the officials were OK with this as they understood the need to look after our things with all the scamsters and touts hanging about. The bike checking process stated to get stricter and more thorough the further north we went and the process often required checking the engine and chassis numbers on the bike against the registration documents and the carne de passage. As each number was about 30 digits long and hidden deep inside the darkest recesses of the bikes this could take some time and I’ll admit on a couple of occasions the numbers were just made up as both the officials and I couldn’t be bothered to do a proper job. 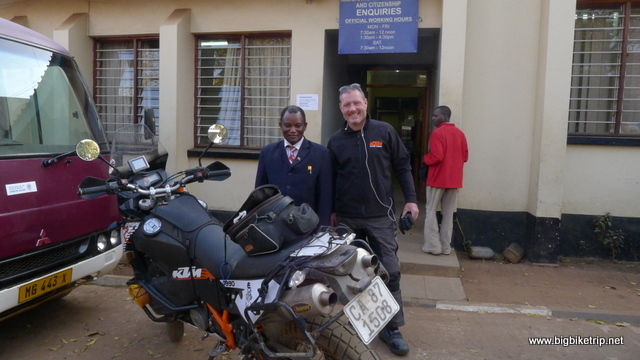 I had already exchanged my Zambian Kwatcha for Malawi Kwatcha in Chipata and I was informed by immigration that my British Passport does not require a visa and since the bikes have Carne de Passages I din’t have to fill in any customs forms, nor pay any import taxes. Hurray! I then handed over Fanny’s passport and was informed that she must go and be interviewed by the senior immigration officer and so we swapped bike guarding responsibilities and Fanny disappeared into an office. After about ten minutes I enquired what was happening and the official said Fanny was going back to Lusaka ( 700 kilometers away) to get a visa. I was speechless and Fanny was definitely looking very forlorn and not a little annoyed. ‘I thought you said you could get a Malawi visa at the border?’ I asked Fanny, but looking pleadingly at the official. ‘She says only at the airport,’ Fanny replies pointing at the offending official who is looking decidedly unwavering in her decision to send the Chinese woman in front of her back to Zambia. Twenty minutes later after even more negotiations we had a letter that informed Fanny she may pass into Malawi, but must go to immigration department in Lilongwe, the Capital of Malawi within 4 days and apply for a visa there. What a result. During that twenty minutes I had pleaded, charmed, showed pictures of my kids, showed pictures of me in police uniform, showed pictures of my friends in police uniform, agreed that the Chinese were imperial raiders of Africa and not to be trusted, and for my star performance noticed that the only document in the official’s in-tray was a bible and so I pleaded that I must get to Mass on Sunday and can’t possibly ride back all the way to Lusaka and miss yet another confession, otherwise Big J wont want me for a sunbeam any more. 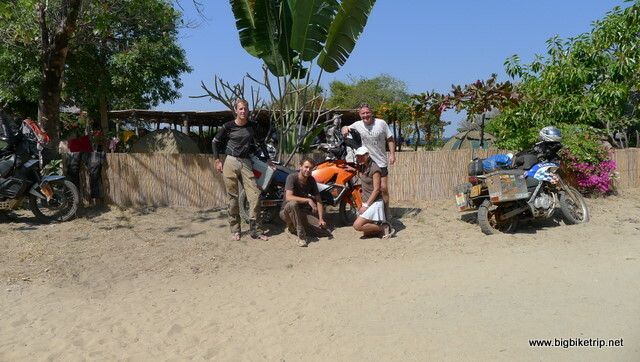 It seemed that riding a motorcycle with a Chinese woman across Africa was becoming a bigger challenge than I imagined. Whether the squandering of Malawi’s foreign reserves by the President was true or not could not be established at that time, but the fuel shortage was definitely true. Lilongwe is only a hundred or so kilometers from the border but I knew we did not have enough fuel to get through Malawi and all the way to the Tanzanian border. Strangely, I was not too bothered. 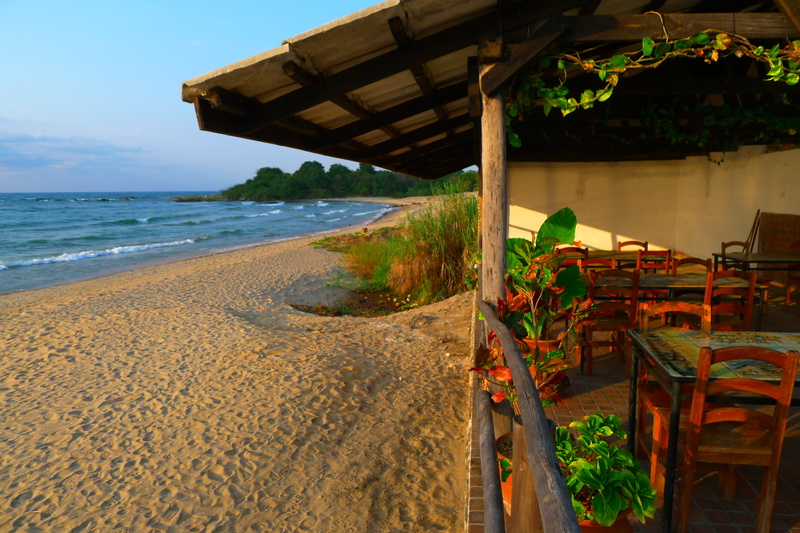 If you want to get stuck somewhere then Malawi is the place, to my mind one of the most laid back countries in Africa. In Lilongwe we found a decent camp site called Mabuya (http://www.mabuyacamp.com/) and stayed there while we sorted out Fanny’s Malawi visa, found new headlight bulbs, ate Chinese food with over a hundred engineers from China who were building a new Carlsburg brewery and also waited at the Tanzanian High Commission for several hours, eating Chicken and Nshima (maze pap) while the largest woman I have ever seen processed our Tanzanian visas. Head of Immigration at Lilongwe, the capital city of Malawi. 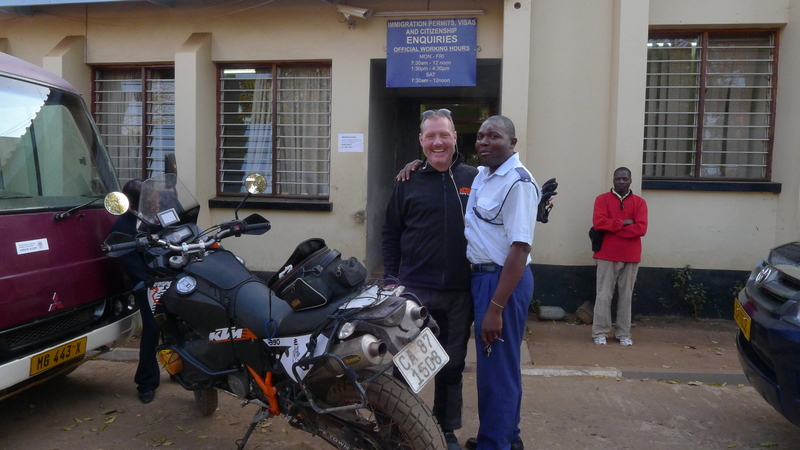 A Malawian policeman and I in Lilongwe. 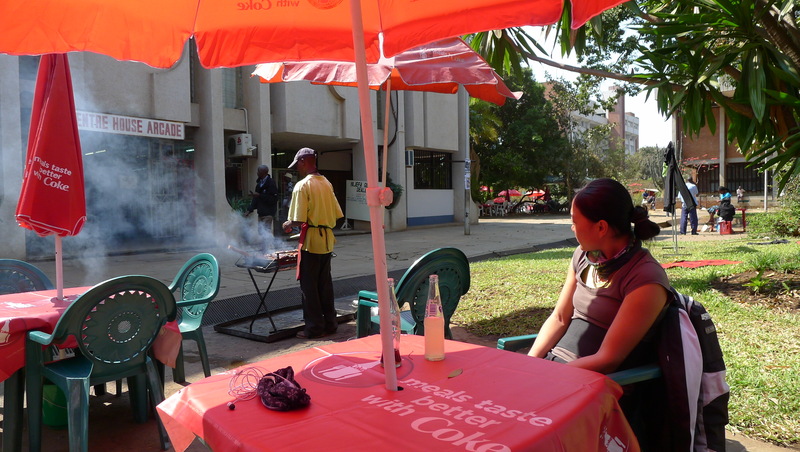 Having lunch in Lilongwe whilst waiting for Fanny’s Malawi visas to be processed. This visa cost US$100, by far the most expensive visa in the whole of Africa. Mine was free. 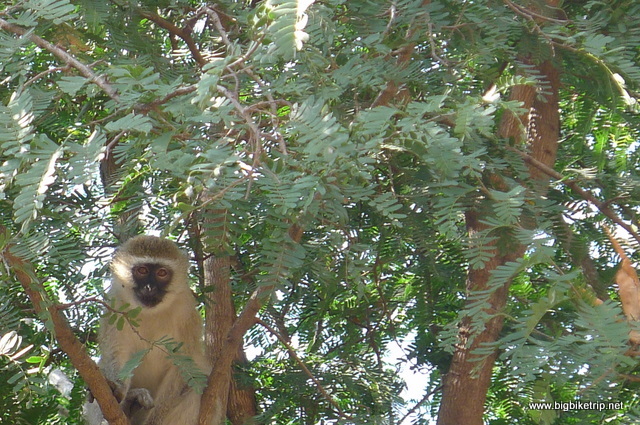 The Tanzanian visas for both British and Chinese passports were US$50 each. 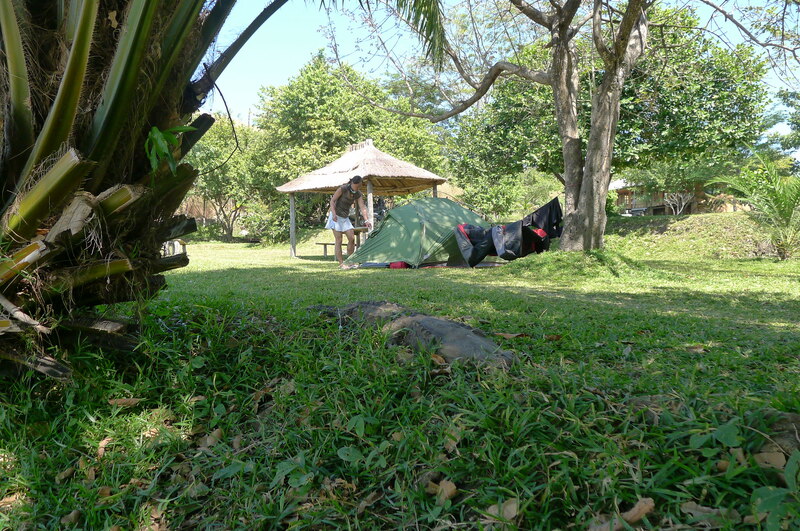 Whilst in Lilongwe we stayed at Mabuya campsite in the heart of the city. I took a sneaky picture of her bottom as she squeezed through the door, but the picture looked like a black cat in a coal shed so there is not much point posting it. 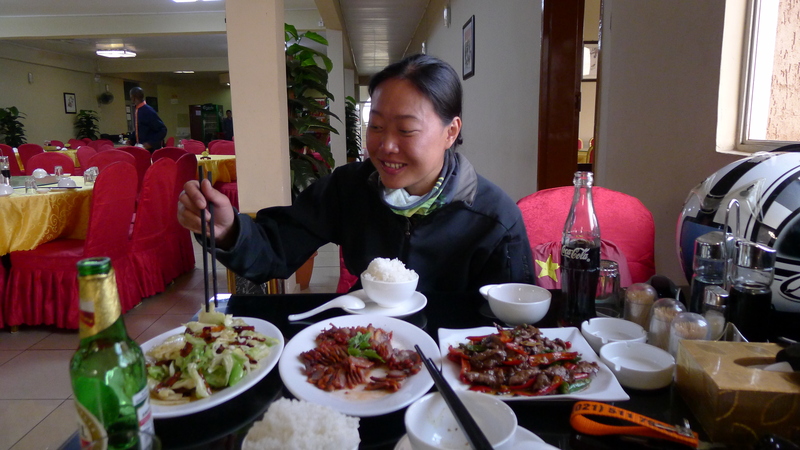 Visa fees were US$50 for both Brits and Chinese. I noticed that Americans had to pay US$200 and Irish US$100. There were some countries exempt from paying a fee for a visa, but most were African. Strangely the list also included Singapore and Hong Kong, but my attempts to plead Hong Kong citizenship failed, despite having a permanent Hong Kong ID card. They said I needed a Hong Kong passport and I was clearly not Chinese. Crazy logic, I thought, and I was about to launch into my Sol Campbell is English speech when I realized it was pointless. Fifty bucks, Pommie. We got Fanny’s Malawi visa which was the most costly of all the visas she had to get in Africa at US$100, and also both of our Tanzanian visas in Lilongwe and then scoured every petrol station in the city for petrol. 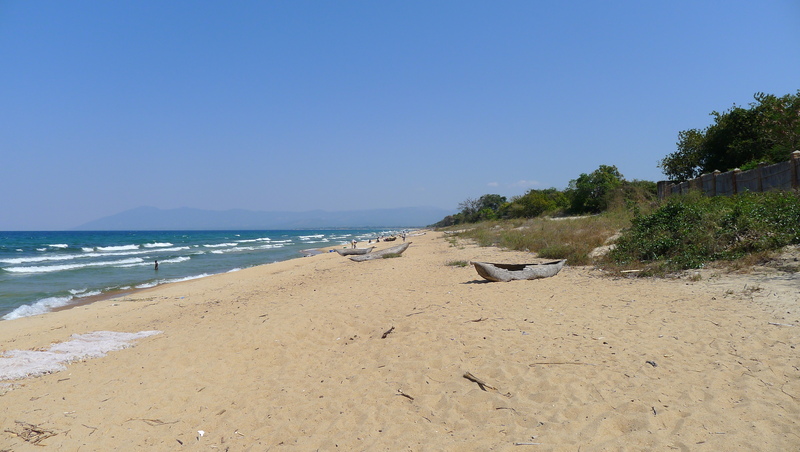 We were out of luck, there wasn’t any and so we pushed on through spectacular scenery to Silema on the southern shores of Lake Malawi. There wasn’t any fuel there either – all four petrol stations were completely dry. There was, however, some black market petrol being sold by the side of the road in liter cans at three times the pump price and quite clearly of dubious quality and provenance, although allegedly from Mozambique. According to each of the road side sellers their competitors had diluted their fuel with maize oil, water and even kerosene –not good for a KTM LC8 engine — and so we did not take the risk and continued northwards along the shores of Lake Malawi through African villages teeming with smiling and waving people in colourful clothes.There were loads of kids, but not many old people in this part of the world. High mortality from AIDS? Poor diet? Poverty? Probably a combination of all three. 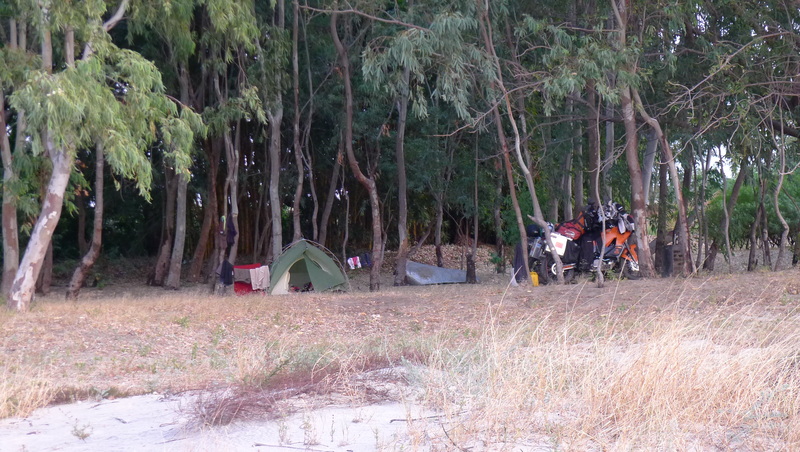 After 150 kilometers I started looking for a place to stay as we would not be able to make the further 200 kilometers to Nkhata Bay where we were hoping to camp up and find fuel. My GPS shows several places to stay four to five kilometers off the main coastal road in the village of Nkhotakota and I randomly choose one called Nkhotakota Pottery and Lodge and as the sun set over the Malawian mountains to the west we rode into the Pottery that was to become our home for a week. The lodge was virtually deserted apart from a Land Rover and a Land Cruiser that were parked on some sand and attached to caravans even Jeremy Clarkson would approve of — off road safari explorer caravans with every conceivable attachment and convenience a person could want anywhere in the world. We parked up on the beach and set up camp. As we were doing so we met our fellow campers, George and Alice in the Land Rover from Cape Town (www.macsinafrica.com) and Steve and Pauline in the Land Cruiser from Durban, who were also touring Africa for a year with their off road caravans. As we got to know each other I shared my concerns about fuel. ‘No worries’, said George, ‘I carry 100 liters of fuel and can spare 20 liters if you want’. YES I WANT. Not being backward in coming forward I accepted the kind offer and our tanks and spirits were replenished, all worries allayed and we settled down with cold beers to watch the light fading over the lake. As we shared stories by the camp fire, and stared out over the huge expanse of water, we saw a bright red globe rising from the lake to the east. Unless the universe had unraveled it must be the moon, and indeed it was, as red as I have ever seen it. 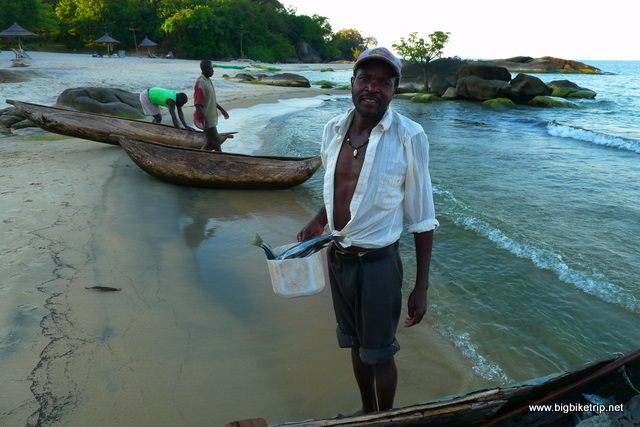 Later, Fanny and I enjoyed a quiet dinner on the beach that consisted of the local fish, Chomba with Nshima pap, and washed down with Kuche Kuche, the local beer. The beer and the fish were good, but I didn’t like the Nshima very much. 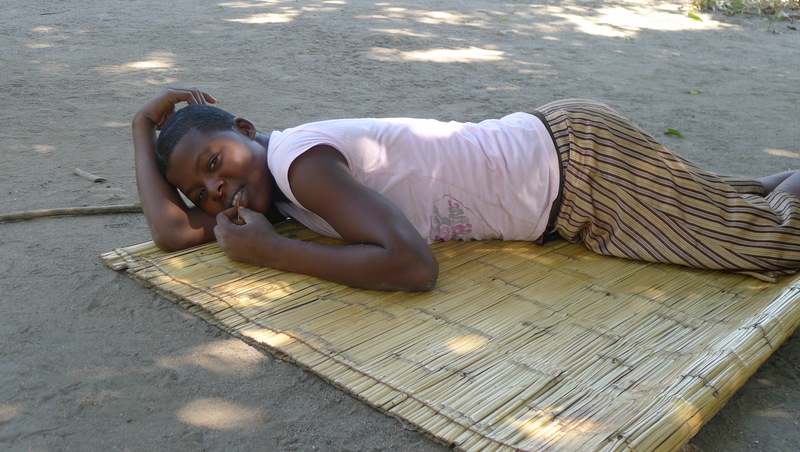 Nshima can be made from ground maize, but in Malawi it is mostly made from Cassava, which is a white flour like substance that comes from the roots of a ubiquitous weed and tastes like a mixture of vomit and wall paper paste and has the nutritional value of a flip flop. Despite its taste and poor food value, cassava is found all over Africa, especially in poor countries like the Democratic Republic of Congo and Malawi and forms the staple of most people’s diet. I made a note for file not to have it again if I can possibly help it. 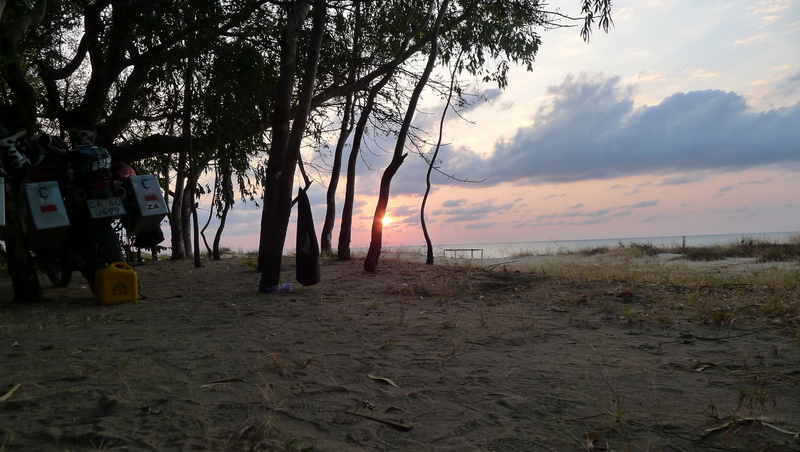 That night I fell asleep to the relaxing and peaceful sounds of waves gently breaking on the sandy shore and the trees swaying in the breeze, my favourite sounds. Since we started this trip it was the first time we were not cold in the night. In fact, the temperature was pretty much perfect. 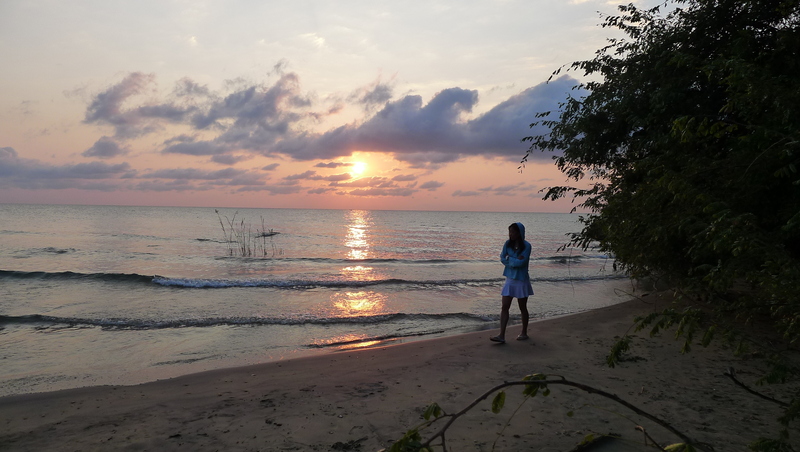 As usual I woke up at the first break of light and later pulled back the tent awning and watched the sun rise above Lake Nyasa and the shadow of fishermen in their dugouts. 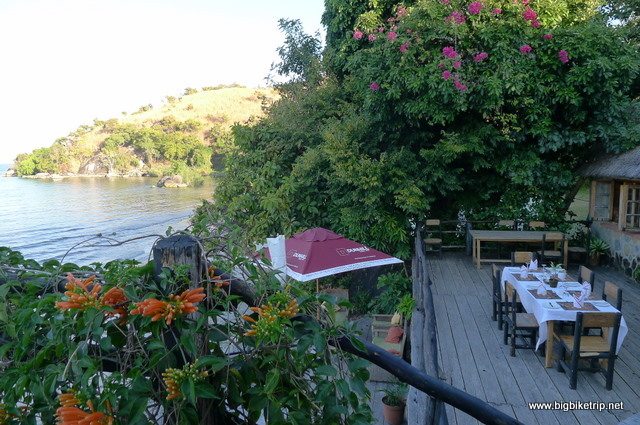 Despite the odd and very vivid dreams one gets from the malaria medication we were taking I had the best night’s rest so far; the fuel crisis was over, for us at least; and I was together with my lovely Fanny in a stunningly beautiful part of the world. We had faced more challenges than we expected in our first month and overcome them all. Both of our bikes were in good working order and Fanny was getting better and more confident at riding. I also had to take a mental pause and ask myself where are we going, and what are we doing this for? I am no longer in the rat race – I have escaped – for a year at least and we were where we want to be. 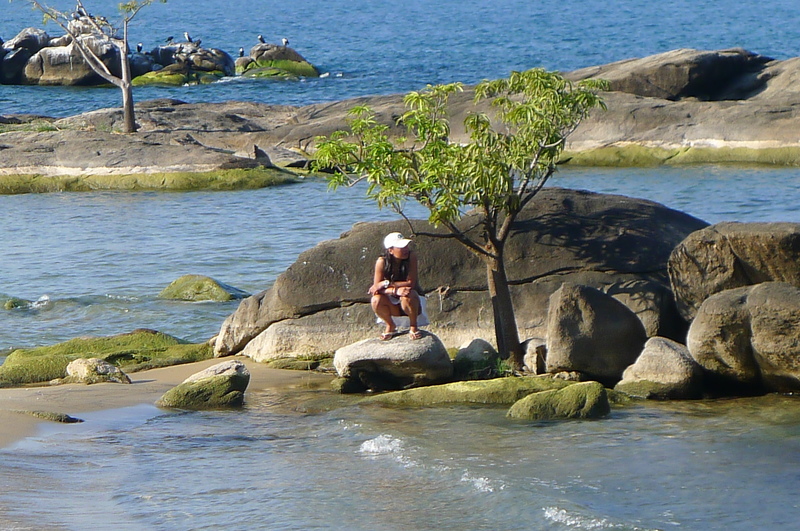 No rush, life is good and so we decided to stay put and slowly make our way up the shoreline of Lake Nyana, relax and live life to the full in a stunningly beautiful part of the world. 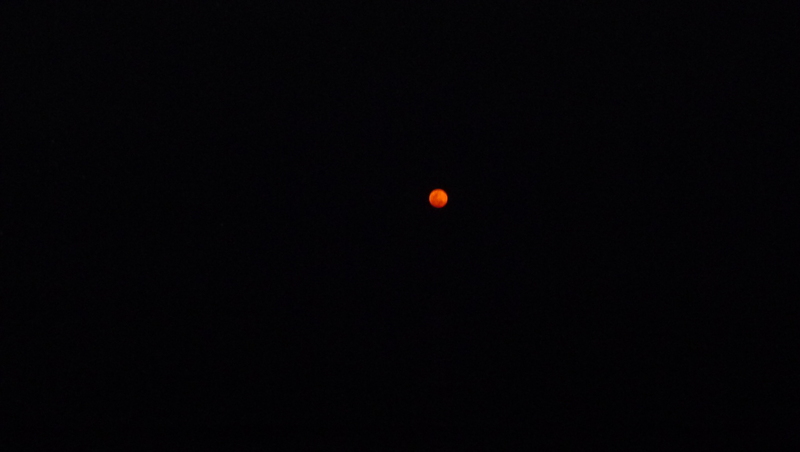 A red moon rising over Lake Nyasa. Not the greatest picture and any night shots seriously pushed the limits of our budget cameras, but a wonderful reminder of an amazing evening and a beautiful location. 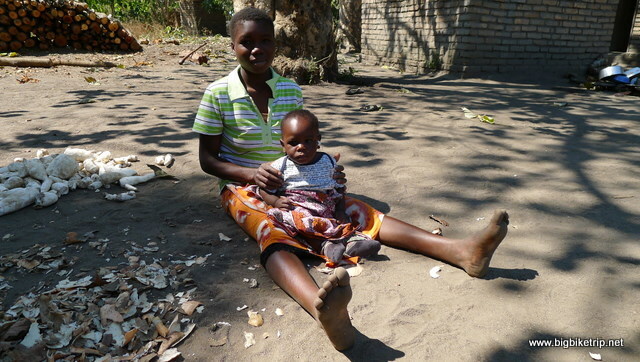 Many of the people in Malawi are desperately poor .. I think having seen a lot of Africa this poverty doesn’t immediately appear as bad as it actually is because of the beautiful surroundings. However, its a tough life for many people. The local people had nothing and many were desperately poor, but they were rich in dignity and charm. The architecture and design used at some of these lakeside lodges is simple, elegant and makes the locations even more relaxing. Superb breakfasts on the beach. Awesome coffee throughout Africa. I started running again …. Fanny and I did some huge hikes along the lakeshore. Usually when I am on holiday I am still at work, blackberry, cellphone and PC at the ready, responding to any hint of a new project from clients and engaging in the unrelenting task of managing a team of highly capable forensic accounting and technology specialists who want, and are clearly capable of doing my job themselves—one day. Usually a period of holiday is not enough to unwind and truly relax if you have a job like I had and many do. Now the planning and hassles of the previous few months were behind us and we could take each day as it comes. This realization, and the fact that the President of Malawi had indeed been squandering all the national resources and funds and generally abusing his power caused us to stay longer in Malawi than we first intended. There was no fuel to go even if we wanted to. 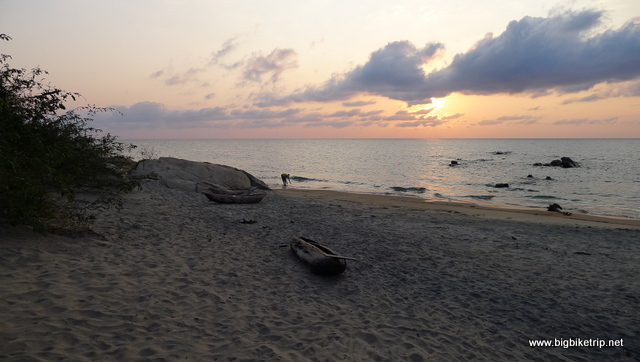 At the popular Kande beach resort we heard that riots were occurring in Lilongwe, Blantyre and Mzuzu, the three main towns and that the police had shot dead 18 protesters. 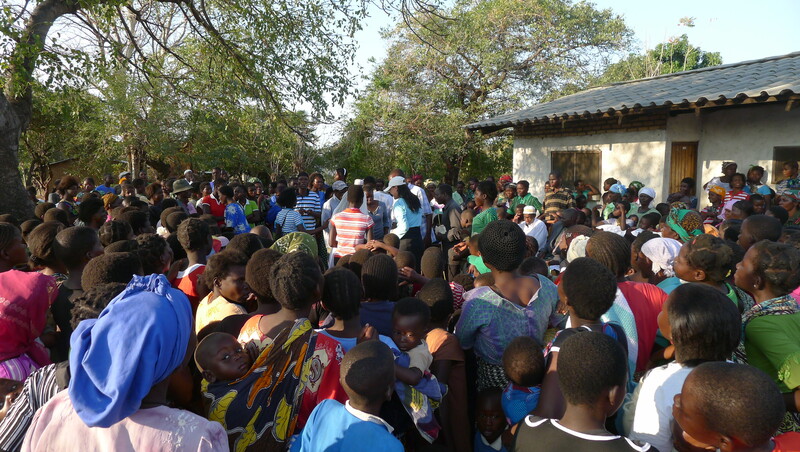 Such violence, all too common in Africa, is virtually unheard of in relatively peaceful Malawi. While we were at Kande we met many Brits who came out to Africa many years ago and simply stayed. Timbo is one of these expatriates. He lived in a beautiful beach house that he constructed himself and is also a motorcycling enthusiast with a XT500, GS750 and Matchless 500 in his garage. Sadly when we were there none of them were in recognizable form although he insisted they were all work’s in progress. Timbo told us over beers in the car how he met the Long Way Down team four years previously when they stayed in Malawi. Ewan and Charlie did OK, but allegedly Mrs McGregor kept falling off her BMW GS650 on the sandy track between the tarmac main road and the resort. In fact, you can see her falling off many times at this exact spot on the Long Way Down DVD. In fairness, it isn’t easy and even experienced riders fumble and panic when it comes to riding on loose sand. Fanny, though, with just 6 months experience, and riding the fully laden orange beast managed it in one go, albeit with a bit of ungraceful sand paddling along the way. Jia You Fanny. 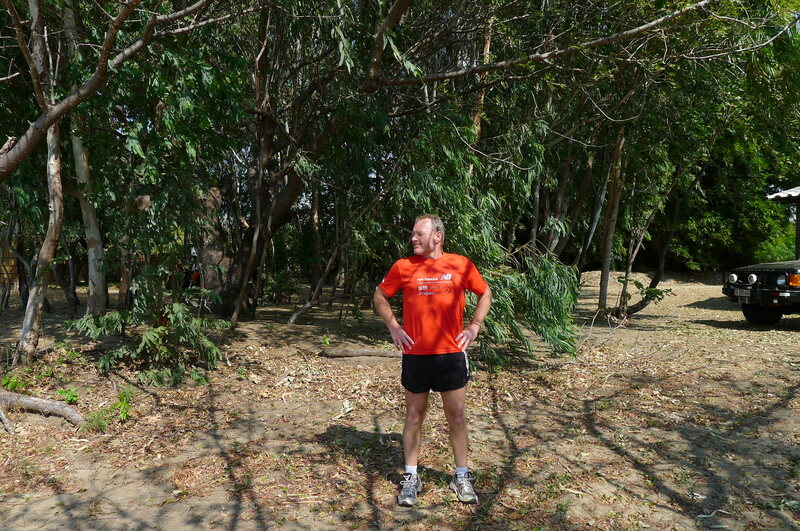 My ribs, which I fractured two months previously by coming off whilst racing and sliding on the big bike sand course in South Africa, were nearly healed and so I started my running, and together with swimming in the lake each day I was getting fit again. 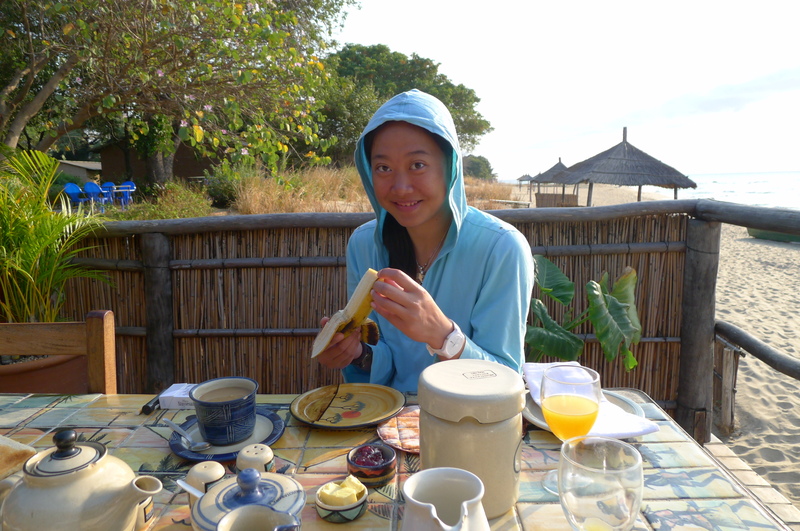 In fact, Fanny and I would often go on long walks and during a 30 km walk through the local villages and beaches one day we found an idyllic spot where we were to camp up for the next five days, called Makuzi Lodge. 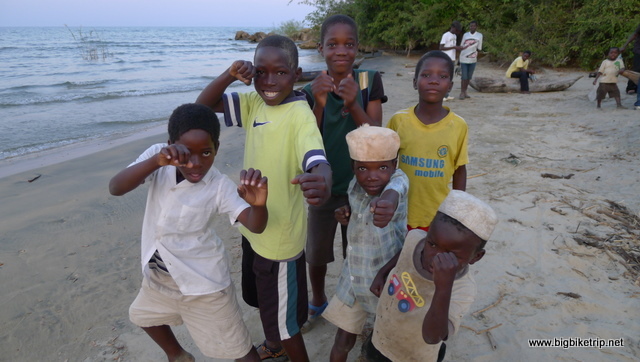 There were lots of overlanders and young travelers at Kande Beach and because of the riots in the nearby towns the number in the lodge had increased to bursting point, but at Makuzi we were by ourselves, camped on flat soft grass next to the beach with only monitor lizards and a troop of Vervet monkeys for company. 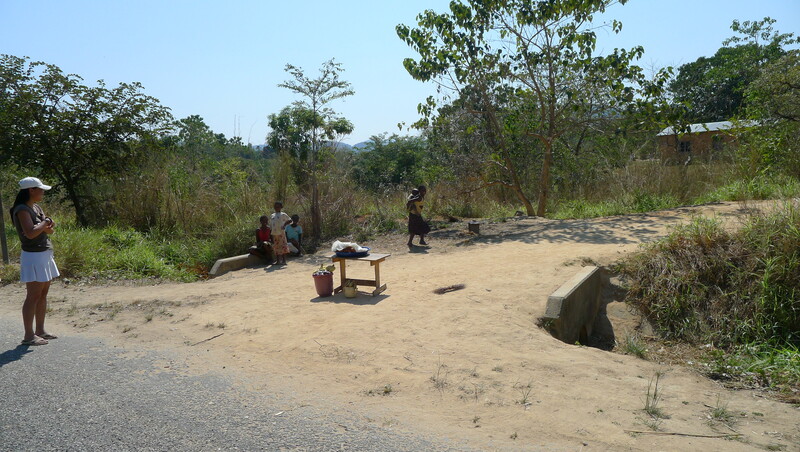 A local witch doctor selling medicinal herbs and muti by the side of the road. Some of the ingredients had an uncanny resemblance to Chinese traditional medicine. 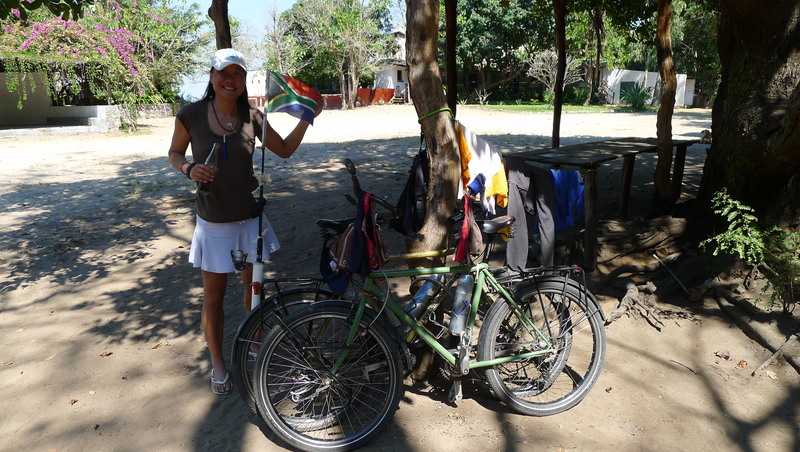 Cyclist from Durban, South Africa who were riding to Cairo (which they did). Bikes parked on some grass right next to the beach. Each night we would sit by the fire until it died down and then sleep well to the sound of gentle waves. 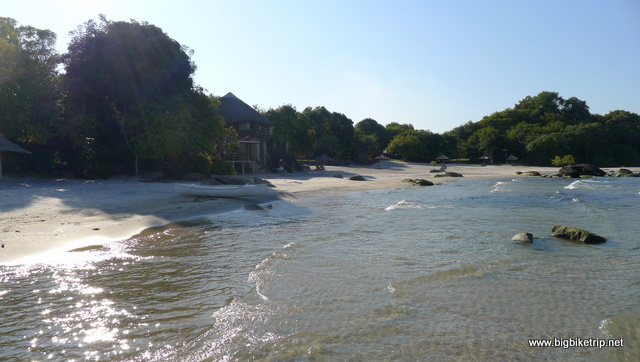 Unlike other parts of Malawi, Makuzi is hidden between two rocky hills and is very secluded. Here the water was calmer and there was an island about two kilometers away where we often canoed out to and went snorkeling to see hundreds of different types of Cichlid fish, some only found in this lake. There were two pairs of Malawi Fish Eagles nested in their eerie near our tent and they gave a spectacle of gliding, pirouetting and fish catching everyday. 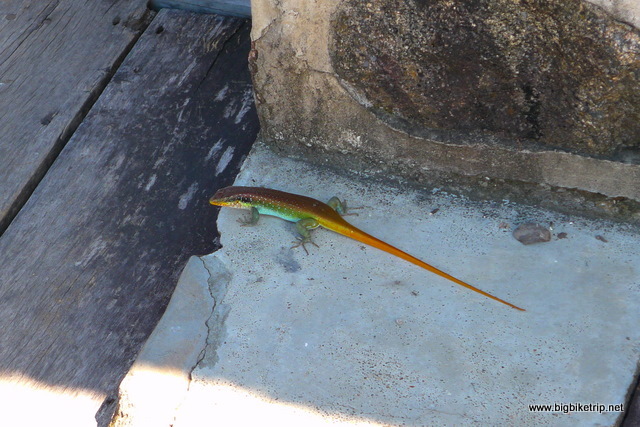 There were also Green Pigeons, Pied Kingfishers, Great Kingfishers, Cormorants, Wagtails, Sunbirds and LBJs. The managers, Richard and Lauren owned a couple of Jack Russell dogs, one a small puppy that would unsuccessfully chase lizards and birds all day and then collapse. 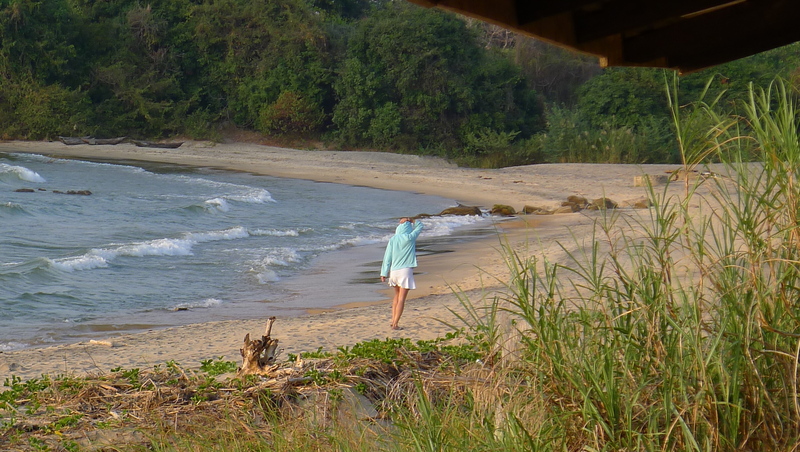 It was truly a paradise, as good as the best places I had been to in South East Asia and was our favourite place so far. A far cry from the chaos and violence in the nearby Malawian cities where the normally placid people were protesting against their kleptomaniac despot leader. Unbeknownst to them at the time he wasn’t to last very long, and by the time we had ridden to Sudan he would be dead and the female vice President, Joyce Banda would take the helm and try and steer Malawi and its people to a better life. The next day we decided to go on another hike. We walked along the sand tracks back to the main road and then headed north for a while. 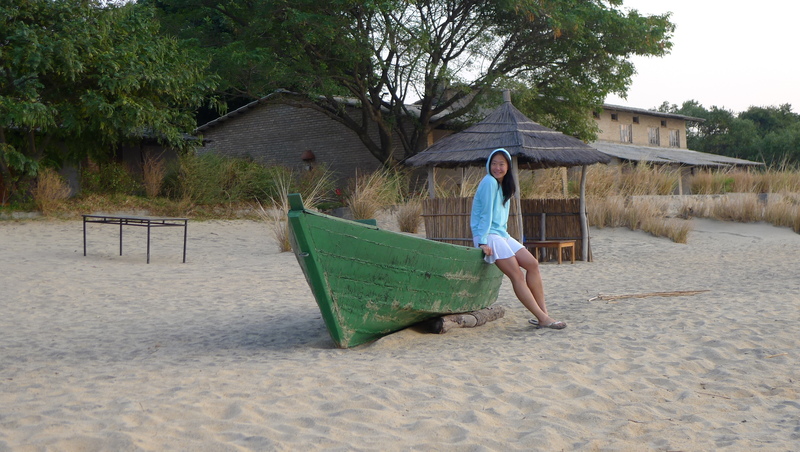 After an hour or so we cut back to the lake and then walked southwards along the beach back to Makuzi. Well, that was our plan and it all went wrong when we reached the lake and realized there was no beach to walk along as there was a swamp between us and our intended destination. 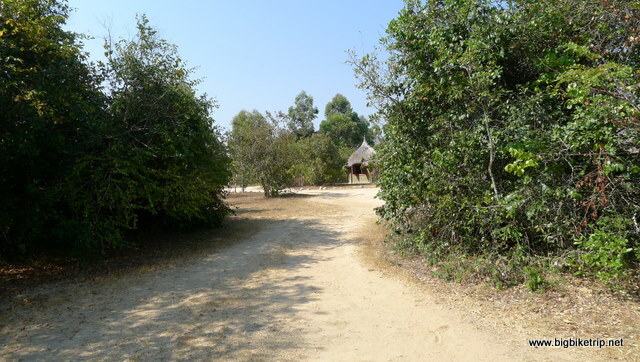 We had no alternative than to hike along village paths, through four to five meter thick and prickly reeds and wade across small steams and ponds. 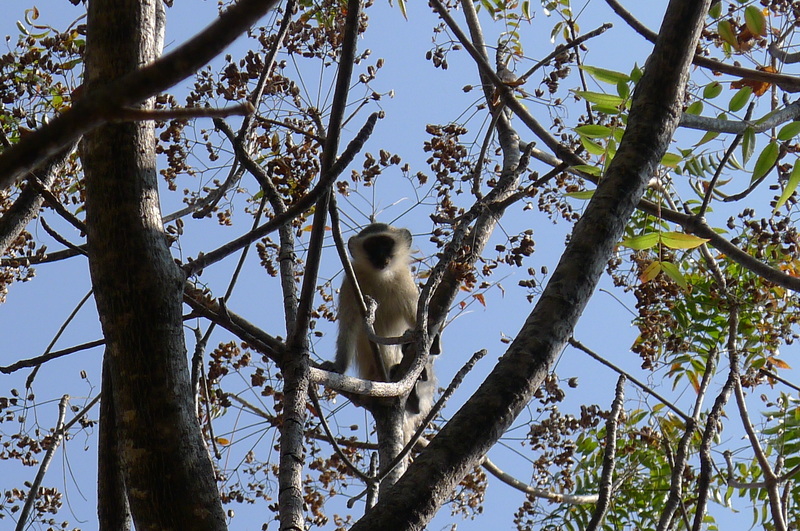 Very soon we were wading in thick swamps and through dense and prickly vegetation. I remember from my Explosive Ordinance Disposal days in the Royal Hong Kong Police that we were introduced to a psychological concept called the “well of disaster”. It basically means that there is a human tendency to keep trying to make a bad plan work rather than stop, reassess the situation and make a new plan. It is the same concept that gets male drivers lost when they insist they will get back to a familiar route, rather than stop and ask someone the way or consult a map (a very common cause for a road trip argument). 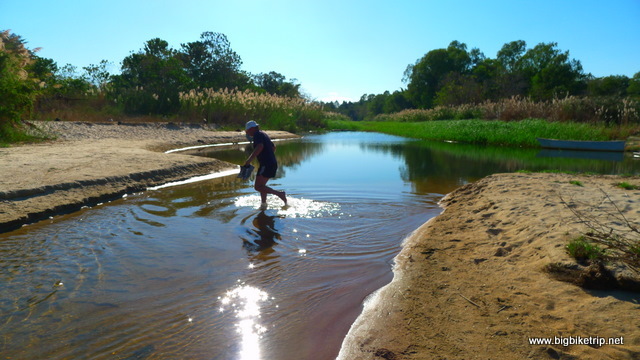 On this occasion I was convinced we would get back onto a track in the belief that the locals must use a short cut through the swamp rather than go all the way back to a bridge across a river some five or so kilometers away. Well, it did feel squidgy under foot and I thought back to the scary “sinking sand” that always featured on TV shows from my childhood such as ‘Tarzan’, and even on distant alien planets in ‘Lost in Space’ and so I suppose it has a special place of dread in my old memory. I was under the impression that snakes were hibernating at this time of year, which in retrospect begs the question, where are they hibernating? Also, for some reason I thought that there we no crocodiles near the freshwater lake. I don’t know about Fanny, but I was frozen on the spot, nervously scanning the surrounding swamp that had suddenly become very hostile and terrifying. The old man gestured to a young girl who was instructed rather reluctantly to slide down the slope and rescue the daft Mzungo (we foreigners). After a seemingly long and rather embarrassing rescue we were escorted along a firmer underwater path and out of the swamp to relative safety. 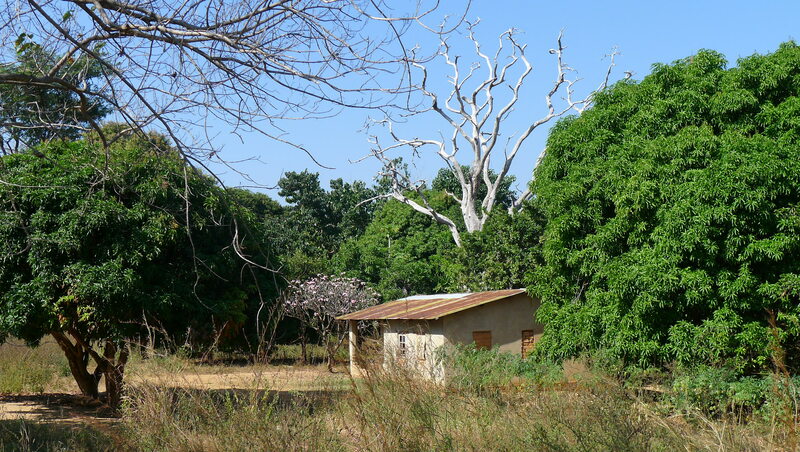 As we did the walk of shame covered in black slime past the entire village I muttered to Fanny that I bet there weren’t really any snakes and crocodiles and almost immediately walked past a sign pinned to a tree that warned of exactly those dangers. Fanny and I before we got lost taking a short cut through a snake and crocodile infested swamp. 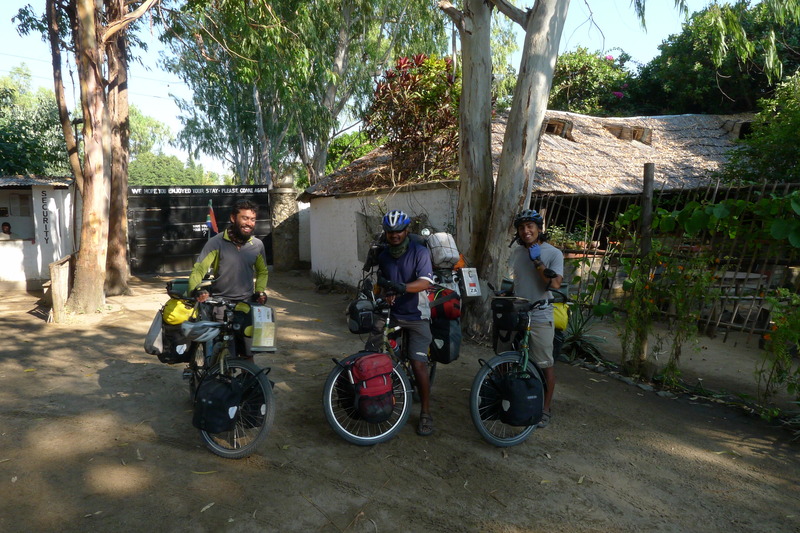 As much as we would like to have stayed for longer, we needed to eventually press on and sadly packed up and rode further north to Nkharta Bay where we had originally planned to stay and where I had stayed four years previously and enjoyed an idyllic rest by the lake. I had mixed feelings when we arrived at Nkharta Bay as we found an extremely crowded and dirty town… and there was no fuel. Not how I remembered it at all. 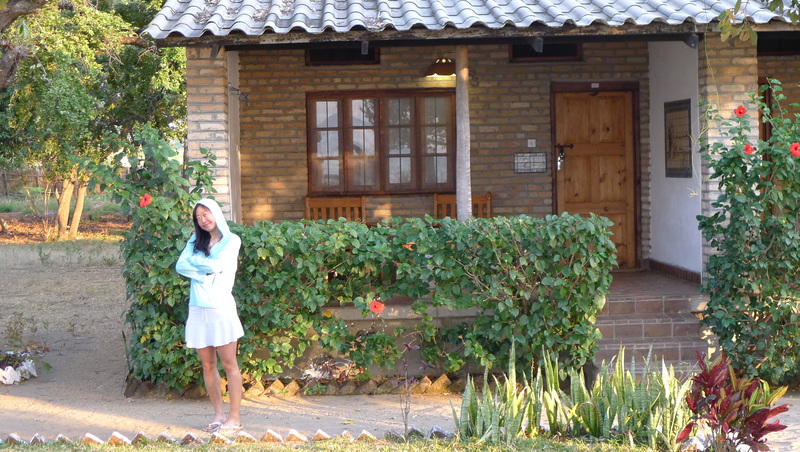 We definitely made the right decision to stay at quieter and smaller villages en route. Despite the reports of recent violent riots we both agreed to move on to Mzuzu and northwards towards Tanzania. As we U-turned in the very busy market place we bumped into the three South African’s from Durban who were cycling to Cairo. 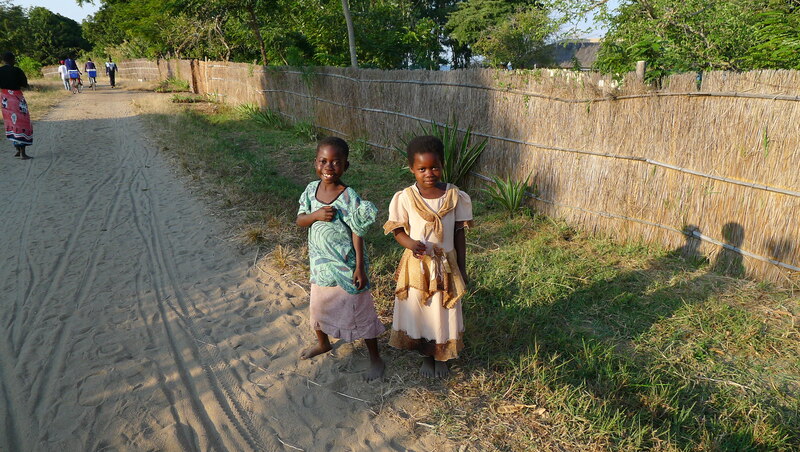 We met them earlier whilst camped up at Kande Bay and they had been waiting for a delayed ferry for 12 hours by the docks to take them further up the lake and avoid Mzuzu and make up time. 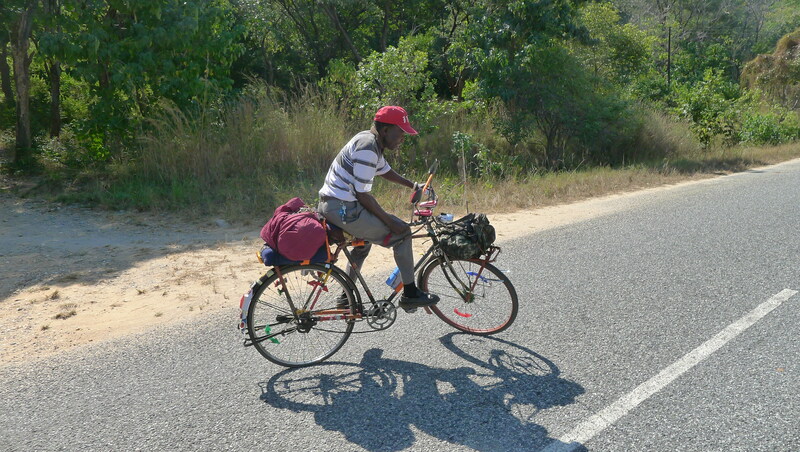 You have to admire and respect these mad cyclists who cross continents, but as we powered up the hill and into the mountains to Mzuzu I had to admit I’d rather be twisting the throttle than peddling the peddles. Apprehensively, we arrived in Mzuzu and saw little of the results of the riots. It is a truly scruffy town at the best of times and so it was difficult to see what was vandalism and what was normal African urban decay. Luckily, despite reports to the contrary, we did find fuel and topped up our tanks and fuel cans and did not hang around. The Chinese and Indian businesses had been targeted by the rioters and I thought it was prudent to get my Chinese girl out, just in case. 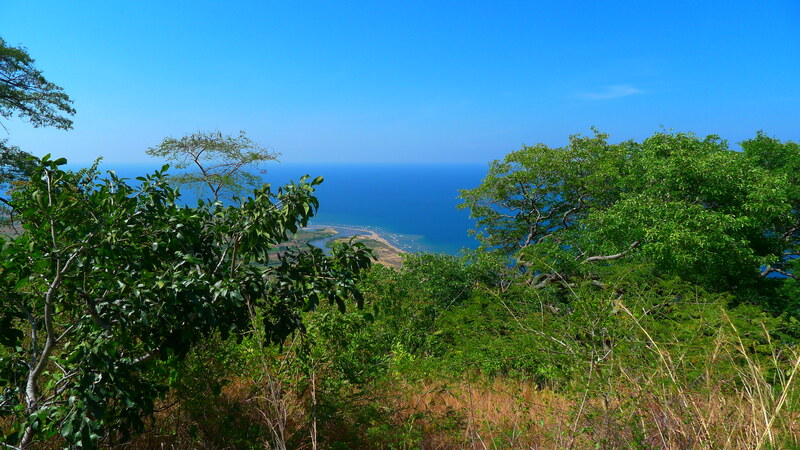 We rode through some truly spectacular mountains and then descended down a very windy road towards the turn off for Livingstonia where we planned to stay up in the mountains overlooking the lake and kilometers of pristine beaches and mountain forests. 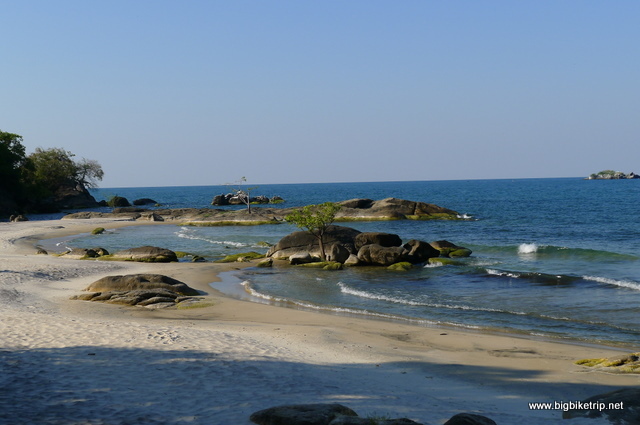 As we turned off the main lakeside road onto the track the surface turned to rock, sharp stones, sand and boulders. It was rather technical and the rocky track wound itself up against itself with numerous hairpin turns continuously for fifteen kilometers to Livingstonia. However, after about a kilometer I looked down the mountain and could see that Fanny had come off. I waited for a while high up on a steep ledge but it appeared she had no intention to get back on her bike again. I’ll say this for Fanny though, she is an expert at picking up a fully laden adventure bike by herself. I did not want to ride all the way down again and so parked up my bike at a very precarious angle on a steep and rocky section of the track and in full motorcycle gear yomped back down to where Fanny was with her bike and she said, point of factly, ‘It’s too hard for me’. 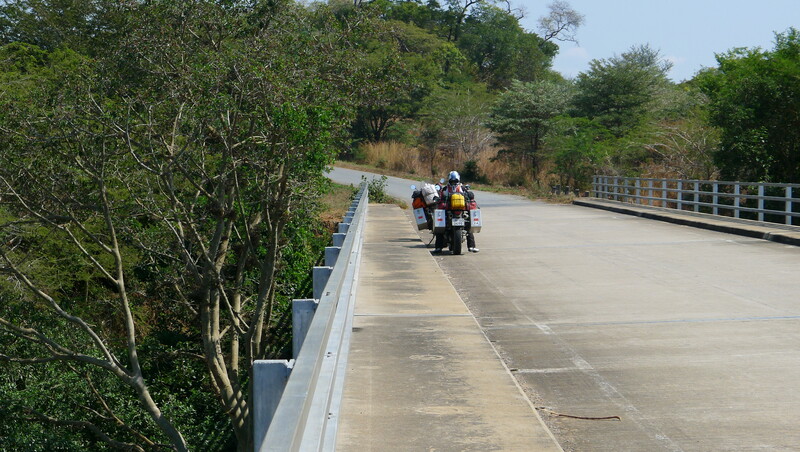 I then had a mad brain wave to ride both bikes all the way the Livingstonia by leap frogging them all the way up the mountain, but after about two kilometers I realized this was a very stupid idea as the hardest bit would actually be riding down the hill rather than up it. 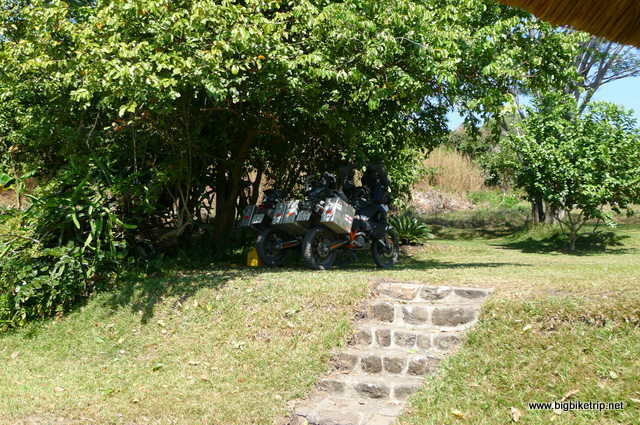 Also the steep rocky track was shredding the tyres and we needed them to ride through Tanzania and Kenya to Nairobi. So after wasting an hour or so I carefully rode both bikes back down the steep track to the main road and we decided to carry on north and look for a campsite else where. I was disappointed to be so near and yet not be able to see Mushroom Farm in Livingstonia. Another time for sure. So, we continued north to the border with Tanzania and I was a bit sad to see the last of Lake Nyana, but when we got to the border we only found squalid places to stay and so in the fading light I asked Fanny if we should 180 degrees and head back to the most northerly Lake Malawi camp site we passed some 50 kilometers away and she agreed and we raced back south again. 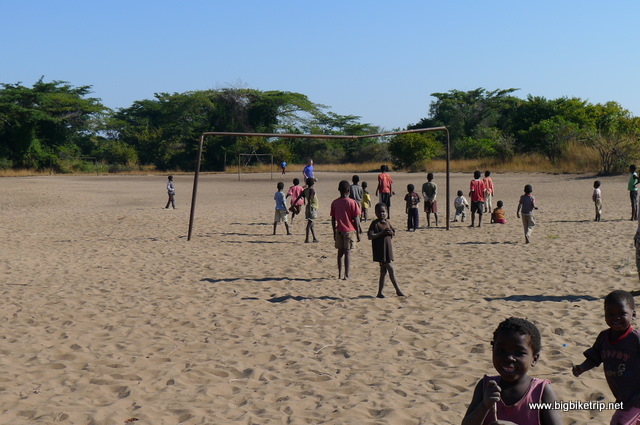 As we entered the camp site, which was on the beach, I saw the South African off road caravans again and we were welcomed by George, Alice, Steve and Paula who were camped up and we decided to spend our last night in Malawi together and get drunk. 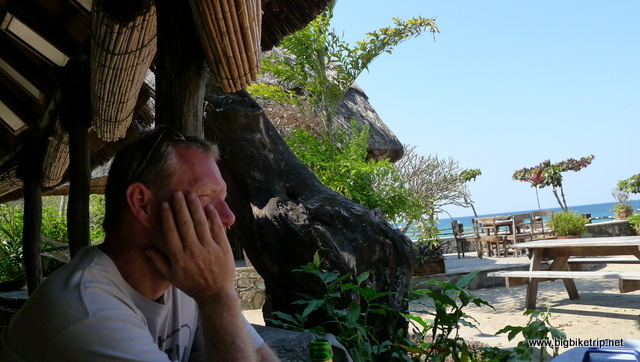 I do not remember much else except that the next day when we entered Tanzania I had a hangover of note. It was so bad that alcohol induced dehydration was not the only cause for my bad health, and later I was to find out why. 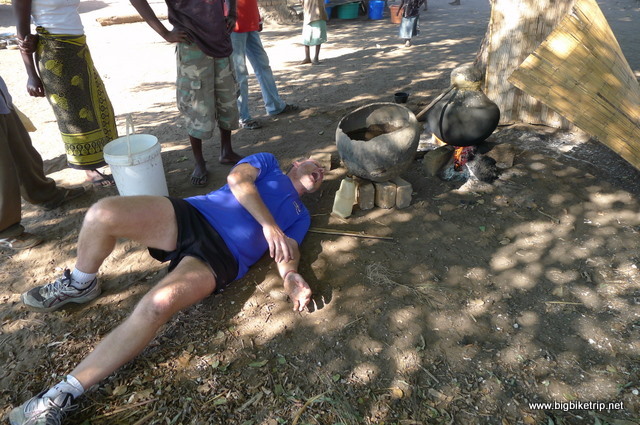 A taste of the local firewater….it would be rude not to …. woooow cough cough!!! I am just messing around for the camera … the Tanzanian immigration guy was fine and just getting on with processing our papers. This entry was posted in Africa, Animals, Elephant, Fanny, KTM, Lion, Rupert, Uncategorized. Tagged Blantyre, cassava, corruption, Lake Malawi, Lilongwe, Makuzi, No fuel, poverty. ah my dears, wow ive only read a few of these entries and will work my way through the rest, im so happy youre relaxed and expierencing such beautifulness!wow. 50KM!! !This is the kind of luxuary definately did not occur with our pushbikes!!!brilliant!!!!! Loving the diary, it is so entertaining. Didn’t realise quite how tough the journey has been..
Keep safe both of you, and we are looking forward to you coming to stay with us when you get to the UK. This is the 1st time i’ve read your diary, keep it up fella I think you re going to inspire me to head off again soon, nearly 20 years since I rode around India and I need to get off of my sofa! Blackie, you rascal. Long time no hear. Few hassles in Nairobi… visas, very difficult riding, dangerouys areas to go through, fuel filters, fuel etc etc.. sent you an email. have a ponder… could be fun.